You can now restrict Google Trends results to YouTube. Just like web search, image search, news search and product search, YouTube is a great way to measure people's interest over time. "Google Trends enables you to take popular search queries and explore traffic patterns over time and geography. 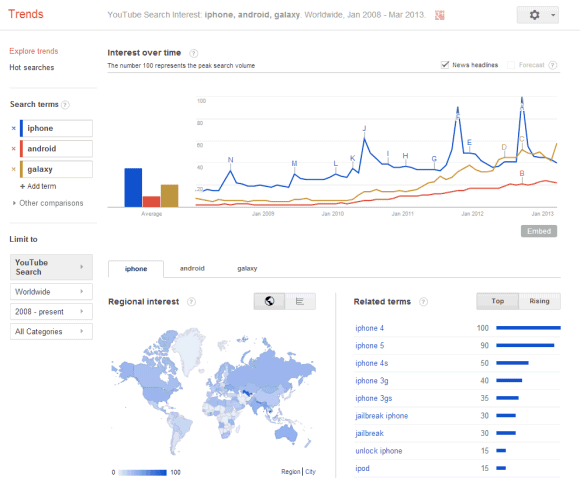 Now we've added YouTube search data going back to 2008, making it another great tool to look at video trends. Visit Google Trends and enter any search you'd like and then, on the left, choose 'limit to' for YouTube. You can slice by region or category as well," explains the YouTube Trends blog. It's interesting to compare web search trends with YouTube trends. For example, [Galaxy] and [Android] are just as popular when it comes to web search, but [Galaxy] is a lot more popular than [Android] on YouTube.